« VIPER SOLFA’s Debut Studio Album “Carving An Icon” Out On February 20th, 2015 via MASSACRE RECORDS! DYING GORGEOUS LIES – New Studio Album “‪First World Breakdown”‬ Is Out On February 20th, 2015, via MASSACRE RECORDS! Dying Gorgeous Lies‘ new album ‪First World Breakdown is out on February 20, 2015 via MASSACRE RECORDS! Recorded and produced by the band and Jörg Wartmann, Frank Jooss as well as Corni Bartels and mastered by Thorsten Scharf and Jarek Zyla. Available for an attractive “Newcomer Price”. 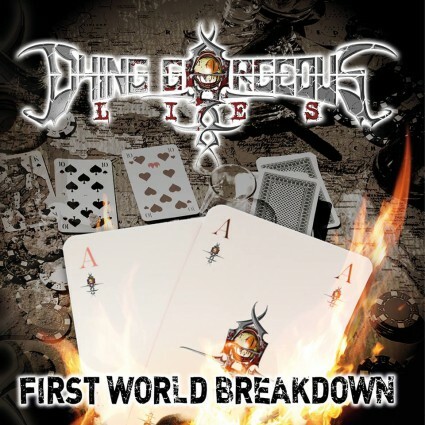 This entry was posted on February 12, 2015 at 11:45 pm and is filed under Metal, metal bands, metal music, Music, rock music with tags dying gorgeous lies, massacre records, metal albums 2015, metal odyssey. You can follow any responses to this entry through the RSS 2.0 feed. You can leave a response, or trackback from your own site.